Content management that will blow your mind. When we were seeking the perfect content management system for our clients, we couldn't find one. So we developed it ourselves. 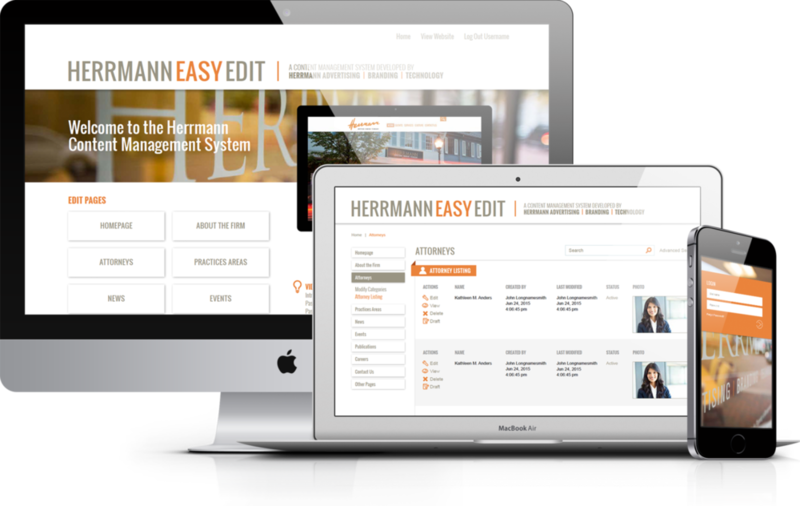 Introducing HerrmannEasyEdit 4.0 – a content management system designed to deliver unparalleled power, all in a robust, affordable package that's easy to learn, use and manage. We think you'll love it. Need a .pdf? No problem. Word doc? No problem either. EasyEdit 4.0 makes it a snap to export your pages in customized formats. From photos to experience to social media profiles, our bio system lets you easily craft an engaging online personality. Speed counts, and nowhere does it matter more than the ability to share news and events quickly and efficiently. Looking to demonstrate thought leadership? Built-in blogging allows the ability to post ideas as fast as you can conceive them. With built-in Google Analytics integration, you can access your site's metrics and conversions faster than ever before. Bring visual storytelling to life by adding rich media such as videos, photos and infographics with the click of a button. Relating content across pages and categories is now easier than ever with one-click access. Foulston Siefkin utilized Herrmann to design and develop our law firm's website. We were very pleased with our new website's responsive, professional, and modern look and feel. The website design delivered a very user-friendly and natural navigation experience. We found that the HerrmannEasyEdit content management system (CMS) was also very user-friendly, and allowed us to internally manage content changes and additions easily and comprehensively. The Herrmann team was a pleasure to work with, respectful of our budget, and receptive to our requests. You're always on the move. Now your CMS can be as well. When we first built EasyEdit more than 10 years ago, responsive design didn't even exist. Things change quickly on the web, which is just the way we like it. So we rebuilt EasyEdit to be fully responsive across all of your devices and platforms. Now you can access, edit and manage your website from pretty much anywhere. Now that's progress. Here are a few examples of the more than 75 sites we've built using HerrmannEasyEdit. As you can see, the look and feel of our websites are completely customized and unique, but the ease of use and integration remains consistent throughout all of them. We can talk to you all day about functionality and feature sets. But the proof is in the pudding. The best way to experience the ease and effectiveness of EasyEdit is to try it out for yourself. Just click that shiny orange button below and you'll be well on your way!